Riverview Station, 191 Lyman Street, Asheville, NC. Contact 310 Art Gallery: 828 776-2716 for Nadine Charlsen's current class schedule. Students choose projects & the instructor for the day will help you to continually improve your work with gentle guidance & encouragement. On ongoing study for beginning artists to professionals. A chance to share your work and learn from each other. Bring: Your chosen materials, projects, brushes, palette etc. Tables, easels, and a cozy workspace are provided for our small classes. If you are not sure what to bring, call 828 776-2716 or email gallery@310art.com. We can provide materials to get you started for a small fee if you contact us prior to class. Marvelous Mondays students working in watercolor, oil and acrylic. Private Lessons with Nadine Charlsen. Nadine teaches in a one-on-one situation for anyone that would like to experiment in watercolor. You can be a complete beginner or an experienced painter. She will work with you for one or more days (usually 5-6 hours a day) to learn the skills you desire to achieve. Private lessons are usually held at 310 Art Gallery unless there is a conflict with other workshops at the Gallery. Contact 310 Art Gallery at 828 776-2716 for enrollment information. Learn amazing experimental techniques, this is NOT your usual watercolor workshop!! You can experiment with; scrubbing, dripping, splashing and glazing and more in an unexpected way! 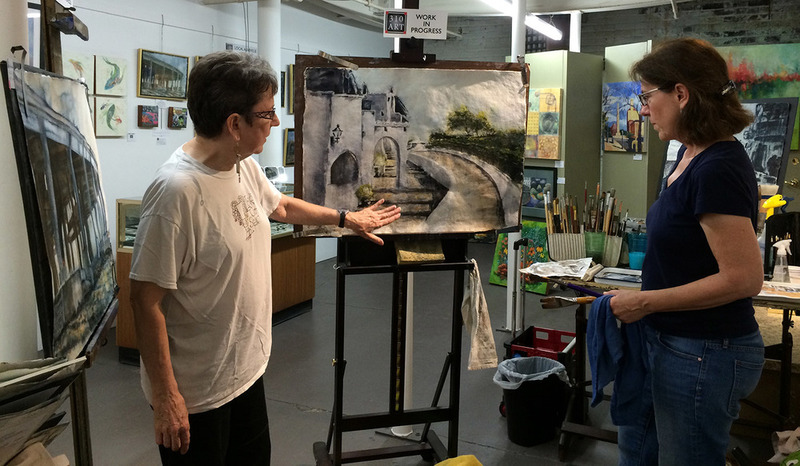 Learn about different papers, non-traditional tools, brushes and painting on an easel. Start new work, bring your own work to salvage/enhance, bring your own reference or use what is provided. Experiment with light and dark before color and creating a strong mood before subject. Have a fun day of loose experimentation. This is a workshop for all levels, artists with no or a lot of experience who want to explore new and free techniques with watercolor. Participants can stay for Super Sunday Watercolor from 1-4 for an added $27 to make a full two day intensive.